Home / Billing / How do I cancel the renewal of my paid subscription? To cancel the renewal of your subscription, please log in to MediaHint (https://mediahint.com). In the “My Account” section, click on the “My Plan” tab. 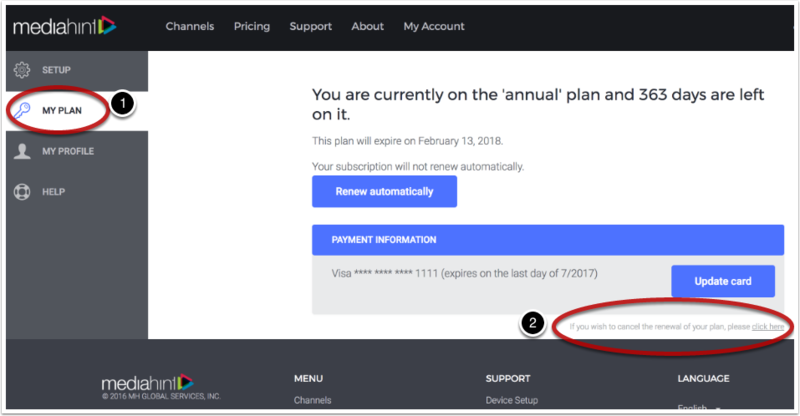 If you have subscribed to a monthly or annual MediaHint subscription, you will see either Premium or Annual followed by your next renewal date. Click the “Cancel Renewal” link in order to cancel your future subscription renewal. You may cancel your paid subscription at any time. If you cancel, you’ll be able to use the service for the remainder of the month (Premium Monthly Account) or year (Annual Account) for which you’ve already paid, but you will not be charged the following billing cycle. Troubleshooting Note: Upon clicking the “Cancel Renewal” link, some users may receive a notification to contact support. If you see this message, refresh the page, click cancel again and you should be all set without any need to contact support. Please do contact us if you’re unsure or have questions about your cancellation.